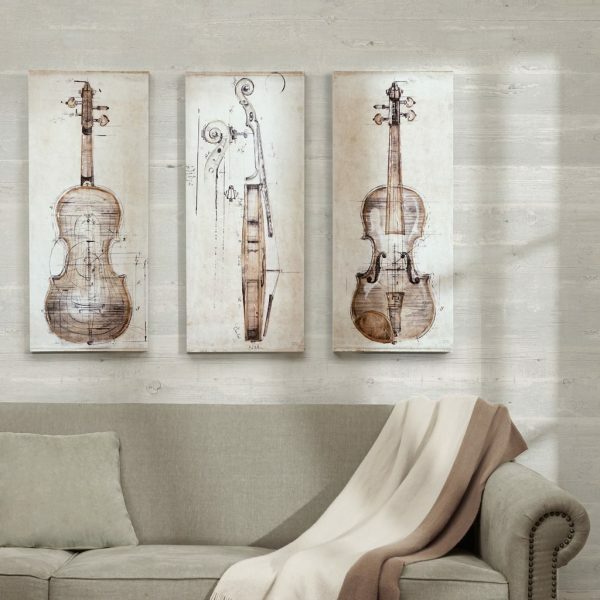 3-Piece Violin On Canvas: The budding Fritz Kreisler or Mischa Elman would be inspired by this set of three canvas violins. Hang them as a triptych for a three-sided view of this classical instrument. 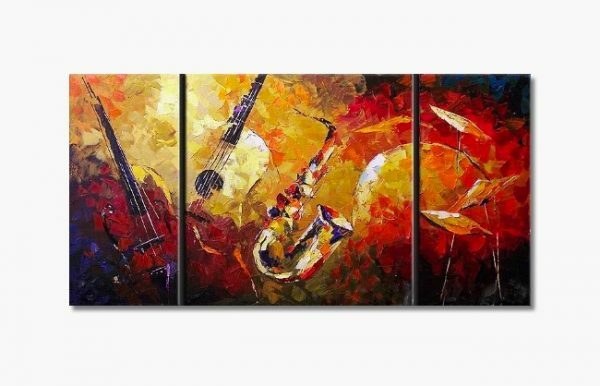 Music-Themed Abstract Art Canvas: Add some music to your dining room with this three-piece acting as one. Bold, vibrant colours present saxophones and violin strings in an abstract quartet. Soundwall Art Speakers: Want to blast music without intrusive big, black speakers? 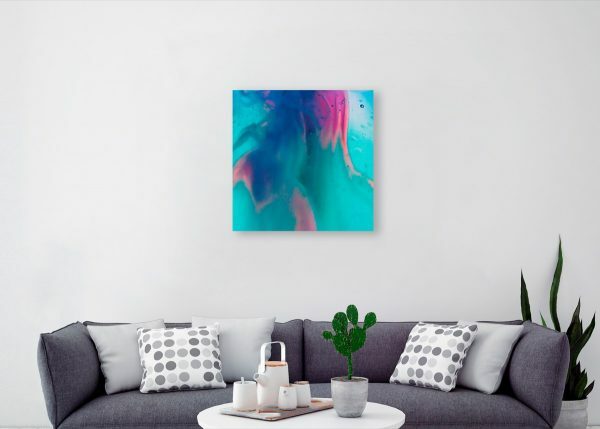 Innovative and easy to use, Soundwall Art uses a painted aluminium screen as a speaker, connecting to Pandora, Spotify or Apple Music wirelessly. The effect is rich, vibrant sound – with any art you choose as the exterior. Framed Music Instruments Patent Art: Glass-framed and ready to hang, these patents for pianos, guitars and drums originate from the 20’s. 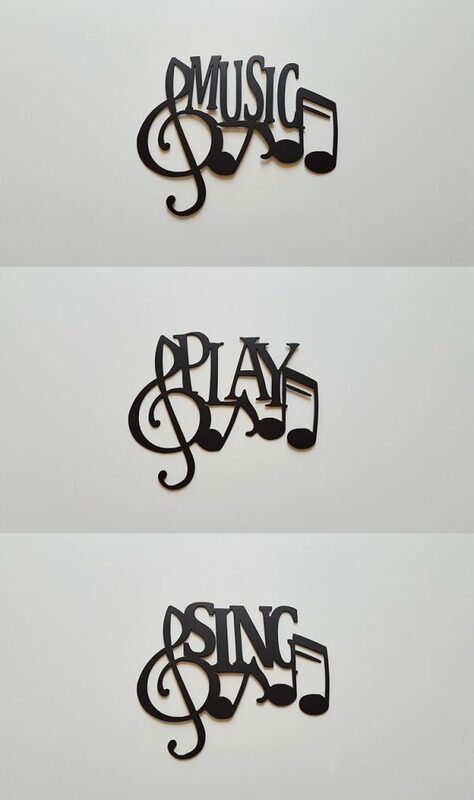 Hang them in your library for a scholarly reminder of your musical passion. 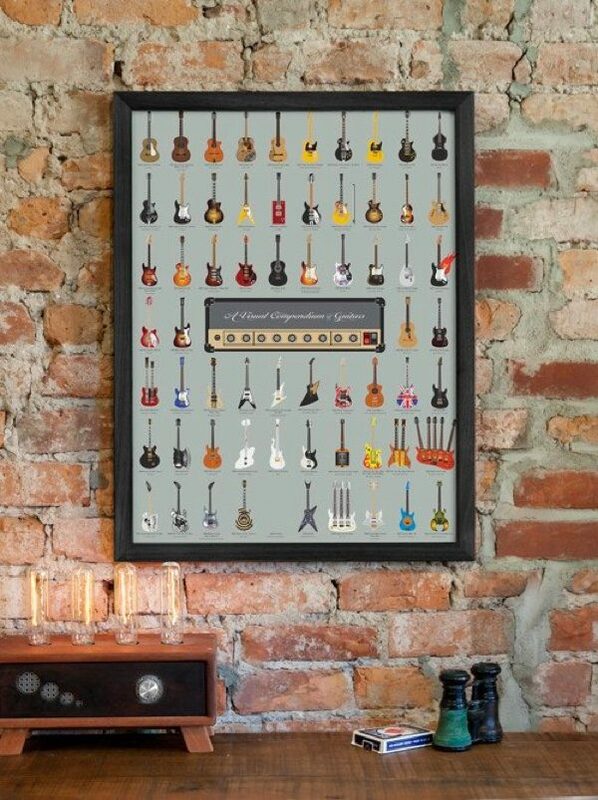 A Visual Compendium of Guitars Poster: Want to consider all options for your next guitar? 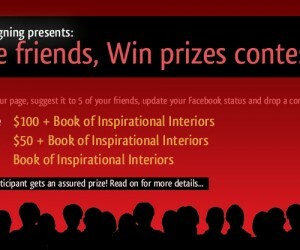 Hang this coloured compendium of the best models upon your bedroom wall. Musical Notes Metal Wall Art Decor: Celebrate music’s simple pleasures, with these black metal hangings astride your wall. A place in your bedroom, living room or rumpus could inspire household song. 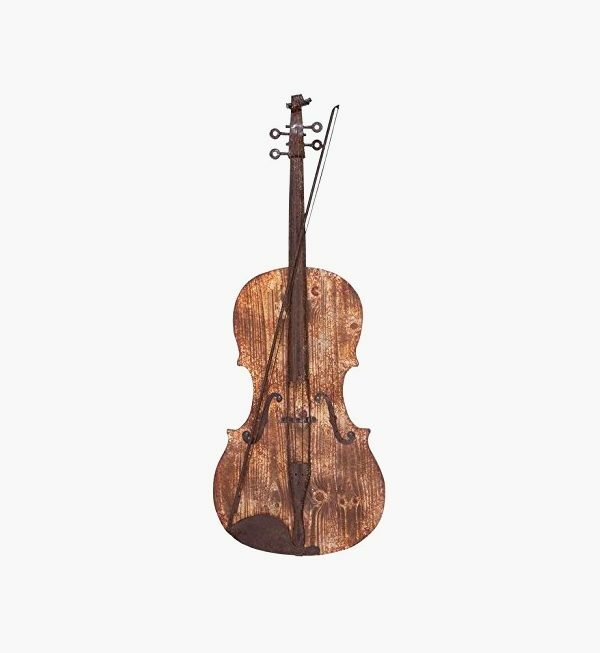 Rustic Wooden Finish Violin Wall Art: Made from wood and metal, this rustic-looking violin adds an antique feel to a contemporary home. Guitar Wall Clock: Laser-cut birchwood created this unique wall clock in the shape of a guitar. 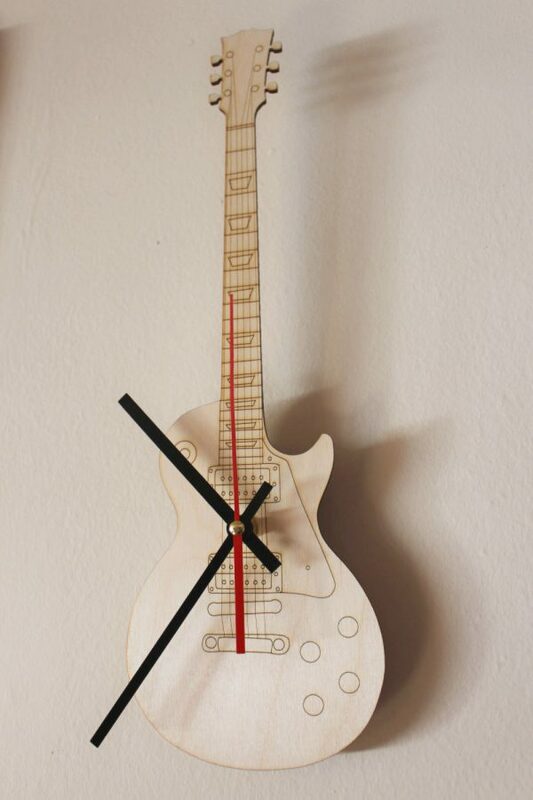 Hang it in your rock-mad teenager’s room, for a cooler way to keep an eye on the time. Music Note Desk Clock: The music lover’s desk would be a perfect place for this zinc alloy clock. 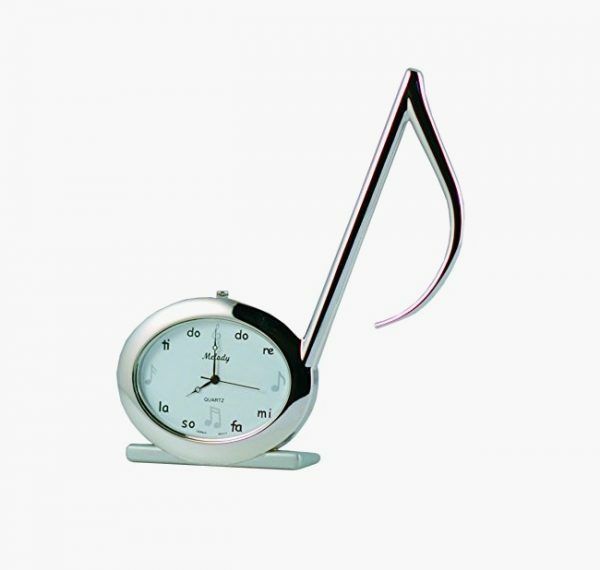 One of the more imaginative clocks, its simple quaver adds an elegant touch to musical interest. 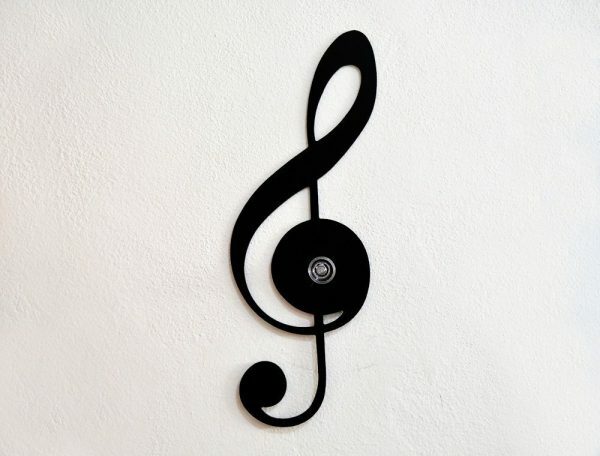 Music Note Wall Hook: Not in need of a clock? This black metal musical note hangs your keys, coat, bag or umbrella. 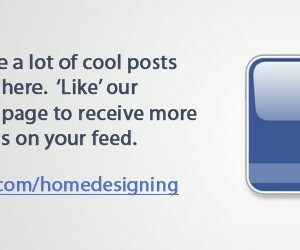 Do check out our decorative wall hooks post for more. 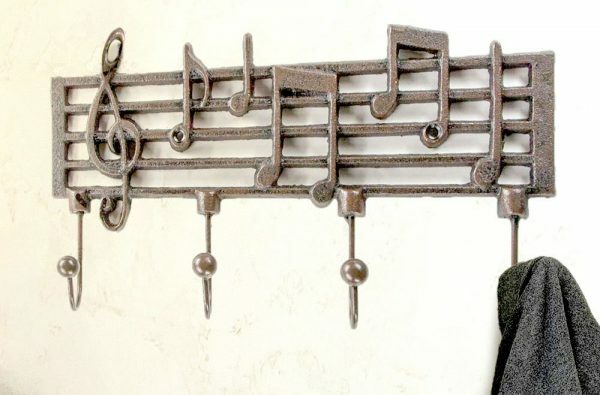 Cast Iron Music Notes Wall Hook: Break into symphony with this family-sized, cast iron wall hook. Keep necessities off the floor as melodies and single notes adorn the wall. 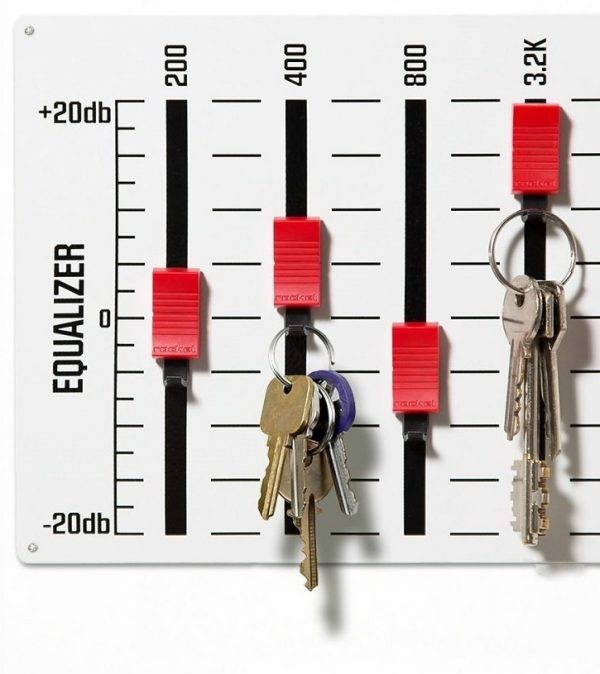 Equalizer Key Holder: The modern music fan knows the best way to equalise. 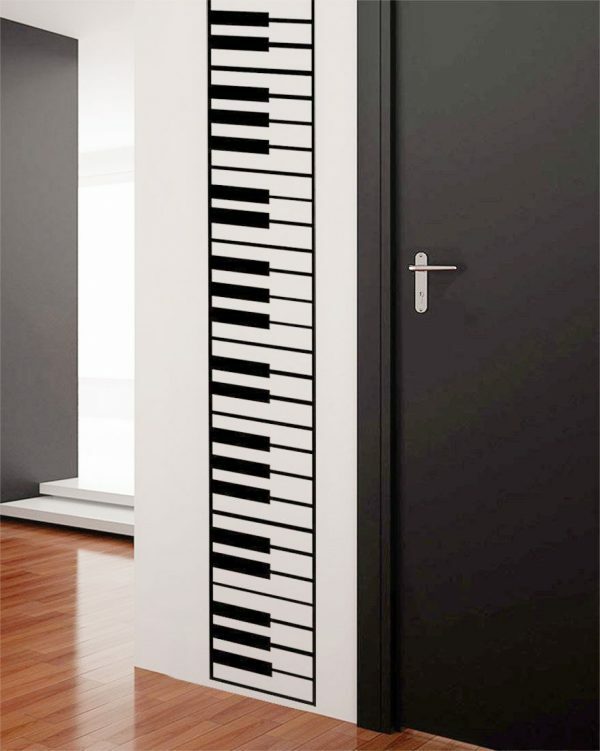 Create good tunes everyday with this nifty find for your front door. Piano Keys Wall Decal: Have a black and white interior in want of a decal? These piano keys celebrate the classical in one quirky design. 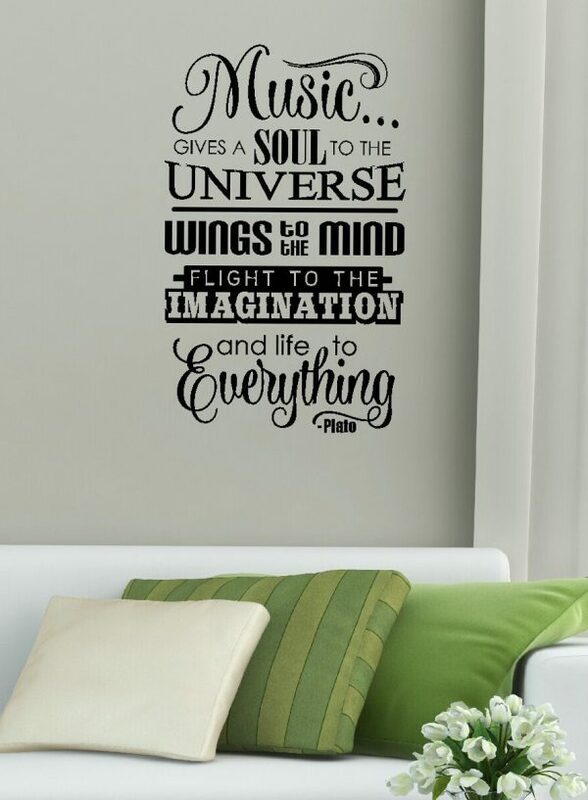 Music-Themed Quote Wall Decal: Plato fathered philosophy and worshipped music. Make his wisdom ring true with a black-type quote above your sofa. 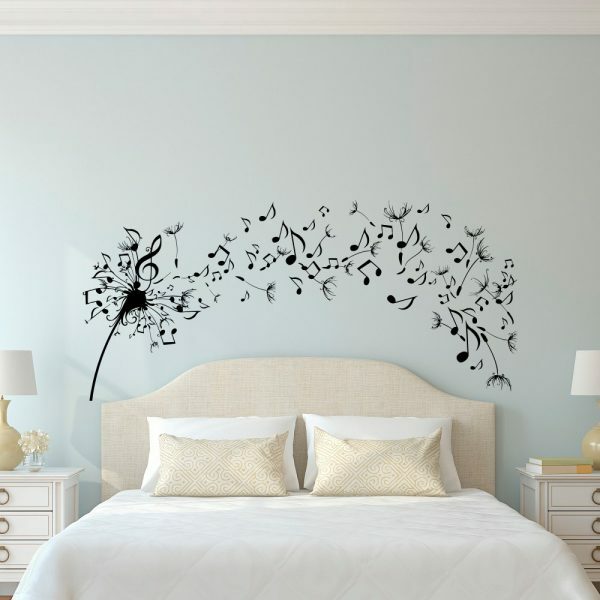 Musical Notes Wall Decal: After a more expressionist view? This artful dandelion blows off sweet music in the bedroom. 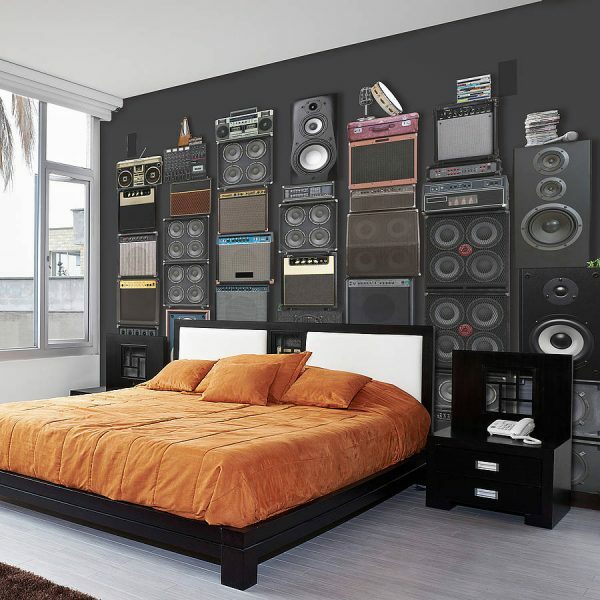 Music Speaker Stack Wallpaper: Printed with a 3D look, this coloured-on-black wallpaper makes a sleek and contemporary bedroom seem eclectic and artsy. 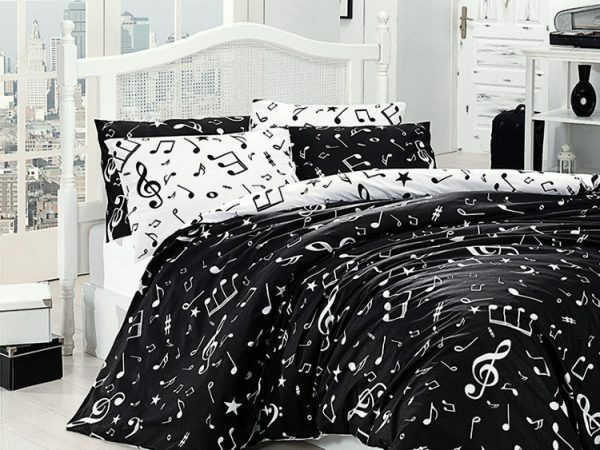 Music-Themed Bedding: 100% Turkish cotton created this black and white piece. Reverse it either way to have a bed all in black, all in white, or as a mix of the two. 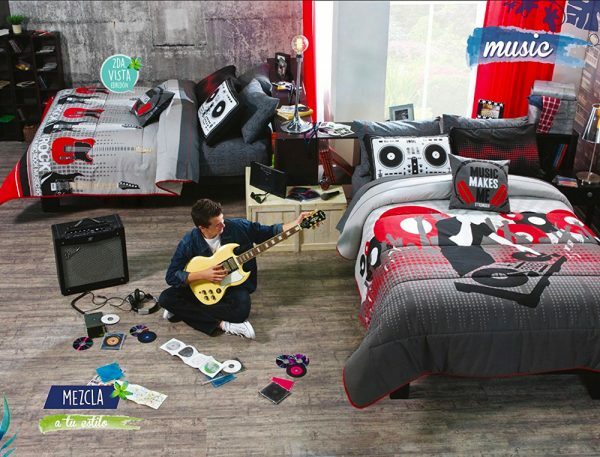 Music-Themed Bedding Set With Pillows: Reversible and multi-colour, this comforter, pillow and duvet can be matched with a separately-sold set of curtains. Strum on the guitar or act the DJ jockey as your kids learn their favourite tune. 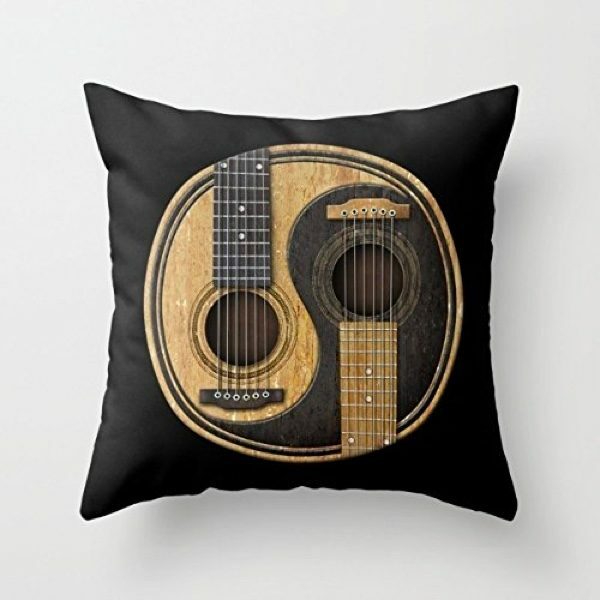 Acoustic Yin & Yang Throw Pillow: Always felt guitars had a naturally peaceful rhythm? This throw pillow thinks so too, as it harmonises guitar strings with Chinese yin and yang. 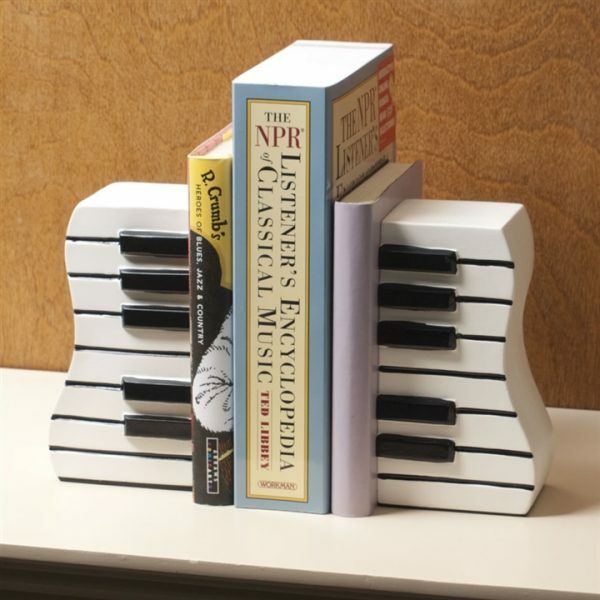 Keyboard Bookends: House your piano scripts in style, with a keyboard bookend either side. 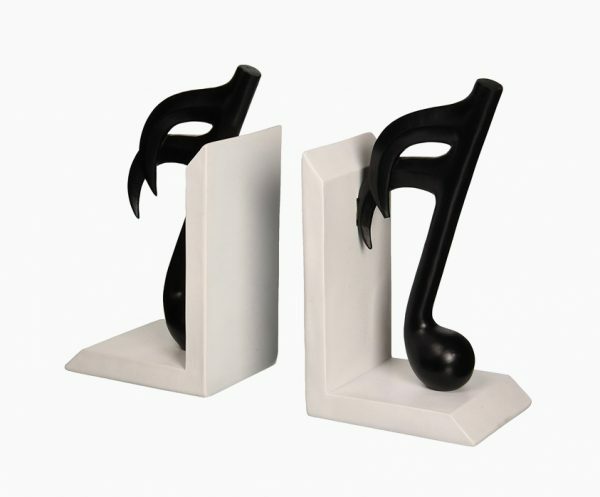 Music Notes Bookends: The monochrome library would find favour in these black quavers. Rest them against your musical reads to combine rhythm and reading. 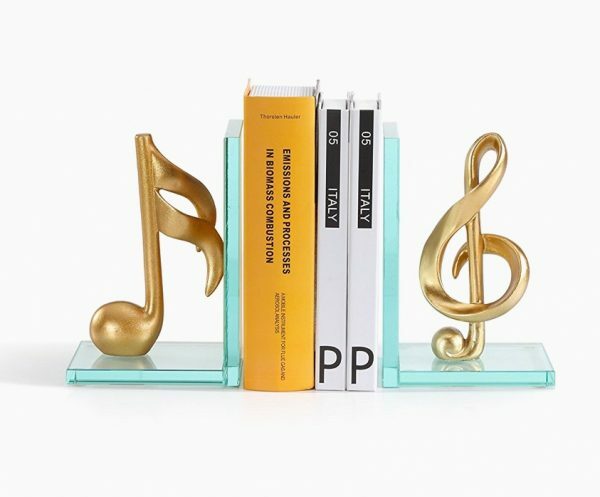 Golden Musical Notes Bookends: Thick glass and poly resin hold your books, in this golden treble clef and quaver design. 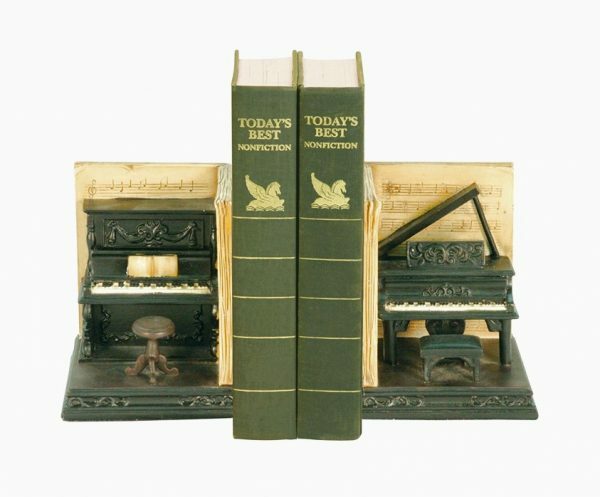 Piano Bookends: Need more than just the keyboard? These full depictions of piano, seat and sheet scripts earn their status as unique bookends. 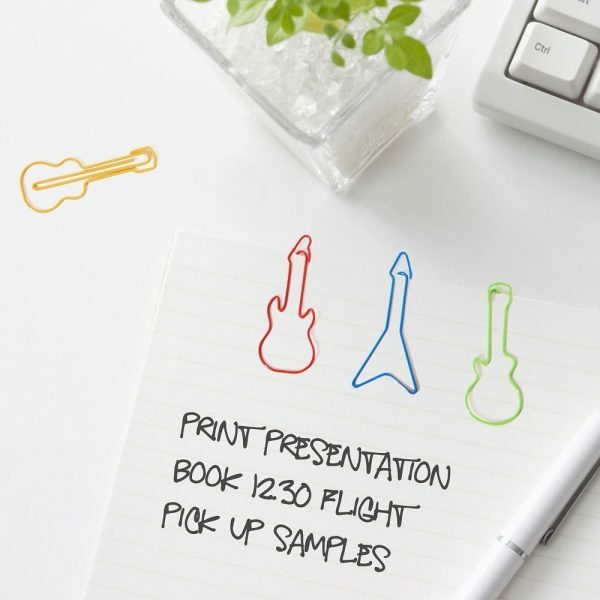 Guitar-Shaped Paper Clips: Add some office flair with these guitar-shaped paper clips. Let a range of guitars hold your papers at your home or work office. 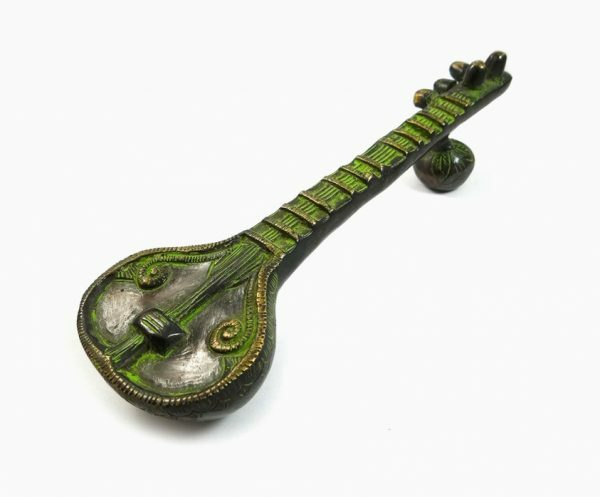 Musical Instrument Veena Door Handle: Want a door handle that says both India and music? This painted brass veena has the extra element of difference you’re looking for. 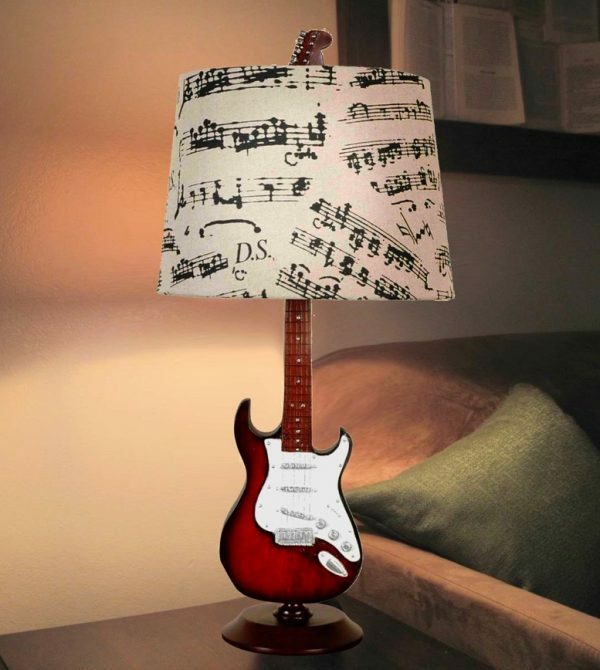 Music-Themed Guitar Lamp: Have a partner who just can’t leave their guitar? Bring it to the bedside table, with this stand and script lamp design. Electric Guitar Switch & Outlet Covers: The music or rumpus room has the perfect outlet in these electric guitar covers. Switch it on or plug it in – and hide the off button from those calling it quits. 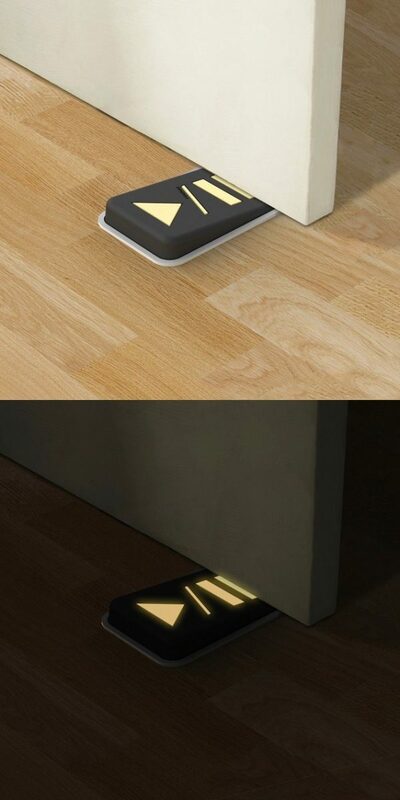 Glow In The Dark Door Stopper: A most decorative door stopper, this wedge mimics an amp pedal whilst glowing in the dark. 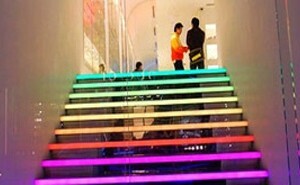 Put it in your music lover’s bedroom for a lit route to a midnight snack. Gesture-Controlled Minimalist Speaker: Supporting Spotify or Alexa, this maple wood speaker is controlled by gestures, not buttons. Tap it on the top to start and play, and on its side to skip towards or back from favourite tracks. 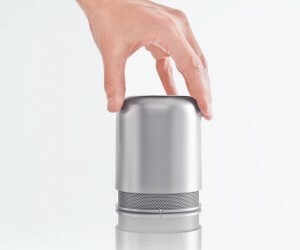 Bluetooth Shower Speaker: Household hummers can’t go past this Bluetooth shower speaker. 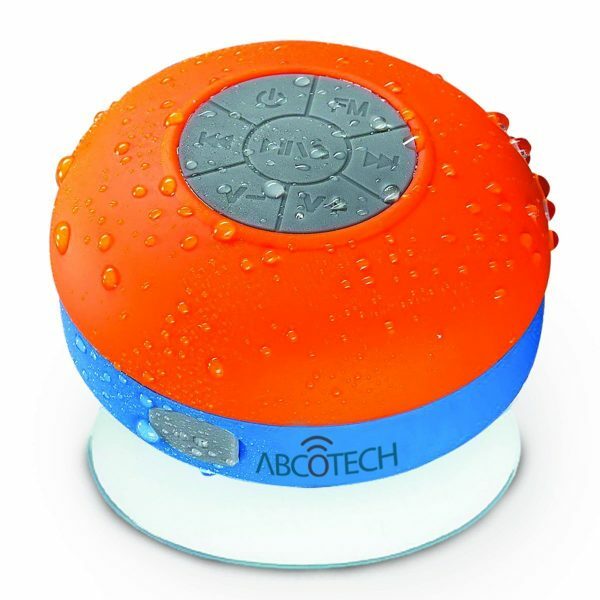 Held to the wall by suction cup, its easy-play buttons and water resistance makes singing in the shower a dream. Scratch Pad For The DJ Cat: Don’t leave your music-loving cat out of the mix. 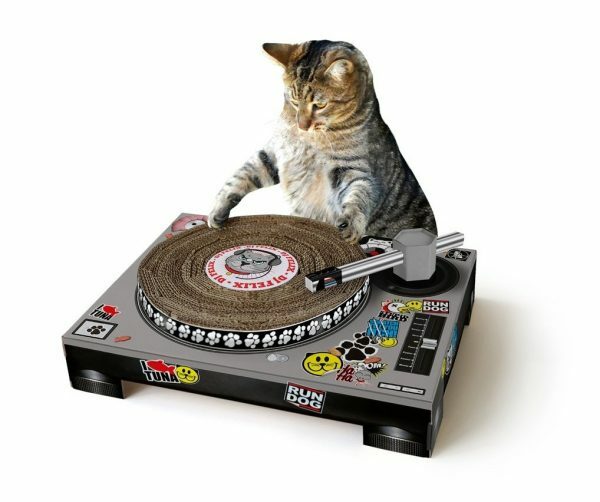 Why not afford them some stylish cat furniture, with this DJ scratch pad? 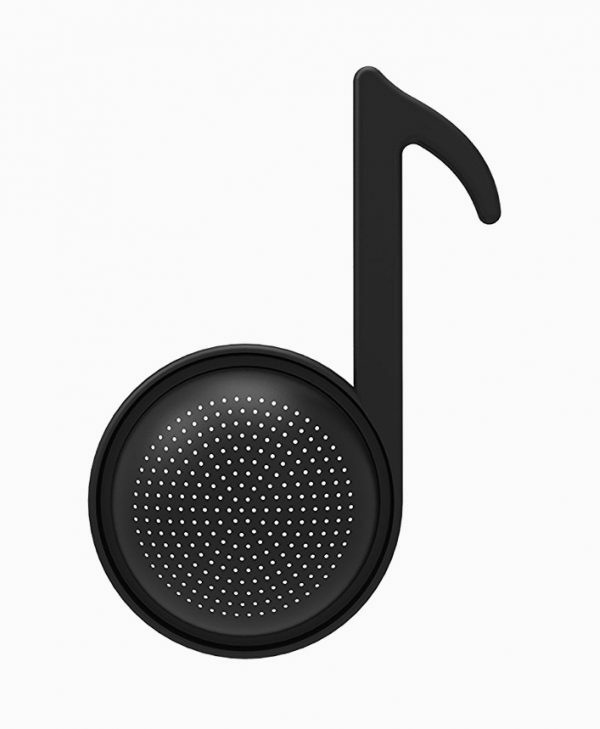 Music Note-Shaped Kitchen Strainer: Make music in your kitchen, with this plastic sink strainer shaped like a quaver. 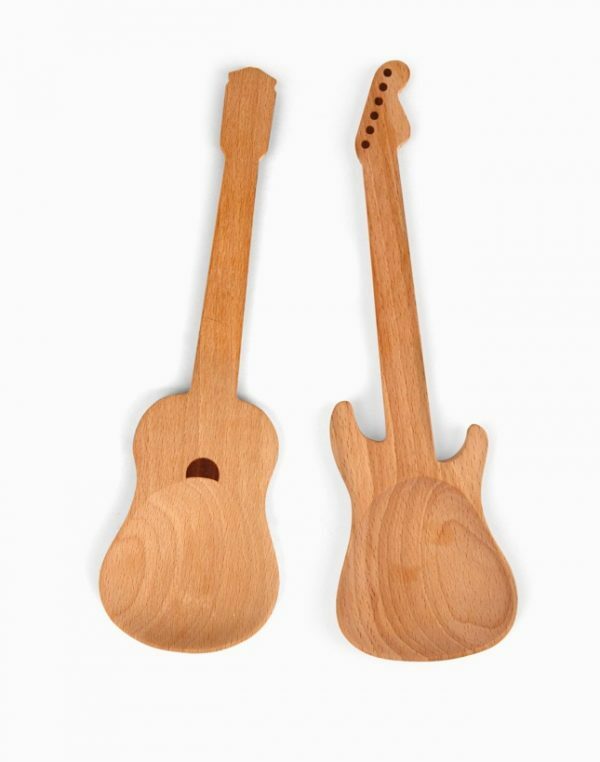 Guitar-Shaped Wooden Spoons: Perfect for your salad, vegetable dish or weekly pasta, these beech wood spoons add rock and roll to your family dinnertable. Drumstick Spoons: Rather be beating the drums? 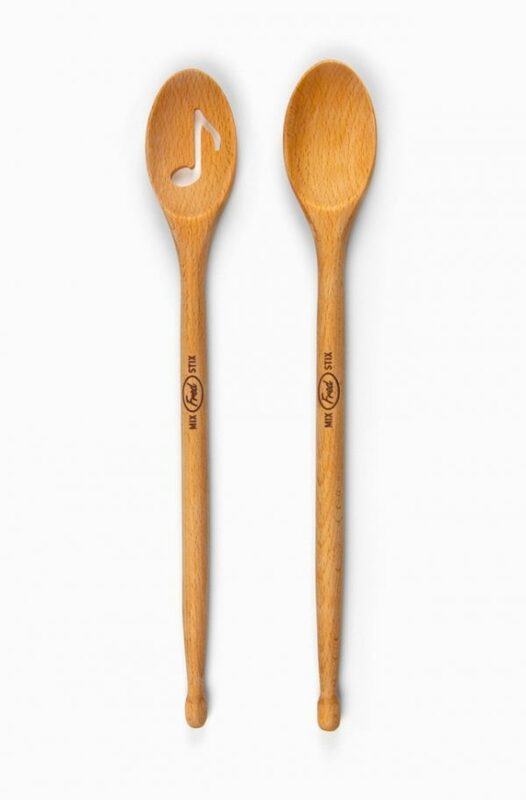 These spoons give a useful tool to kids wanting an early dinner. Music Instrument Flatware Set: Serve a formal dinnertable, with a musical twist. This harmonious set of four is a great addition to the modern flatware collection. 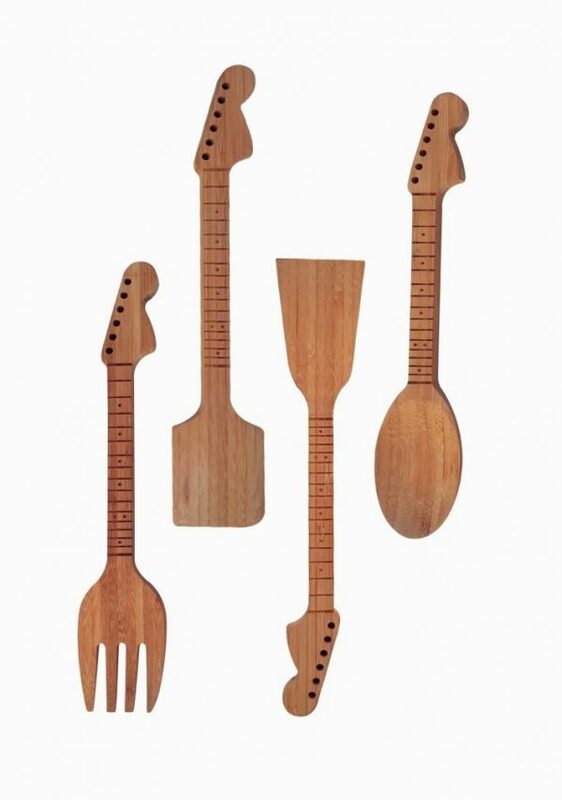 Guitar Spatula: Gift Dad the perfect tool to use at the barbeque. 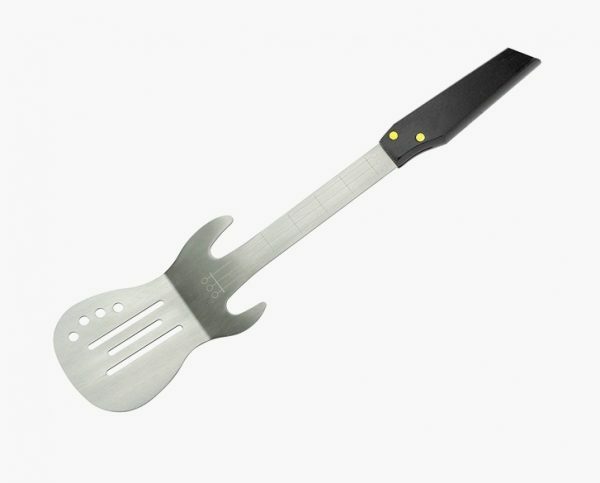 This guitar-shaped spatula looks cool and crafted, while flipping burger patties and charcoal-grilled steaks. 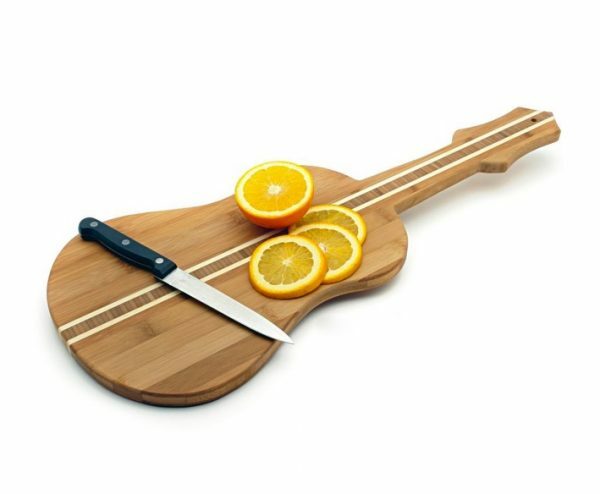 Guitar-Shaped Bamboo Cutting Board: A bamboo-carved guitar is not your everyday cutting board. This curved beauty with a line down the middle creates dinnertime conversation. 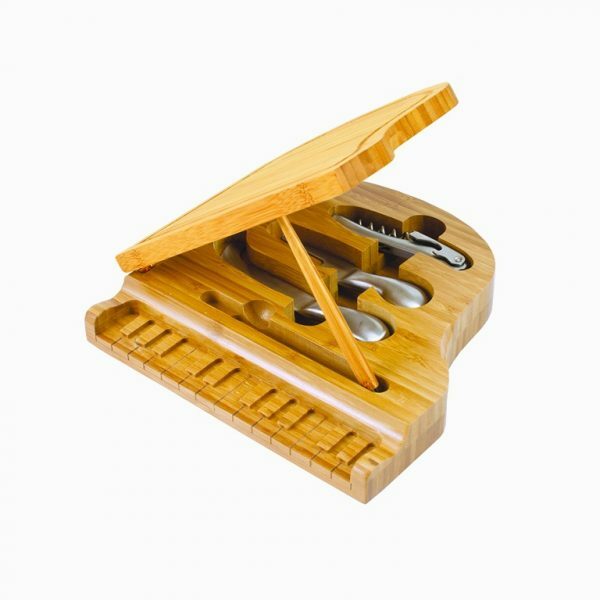 Piano Bamboo Cheeseboard Tool Set: Hide your cheeseboard tools in the piano, with this block holding your knives and slicers. Guitar Salt & Pepper Shakers: See how your salt runs in these clear plastic shakers. Check out our unique salt and pepper shaker post for more ideas for the dinner table. 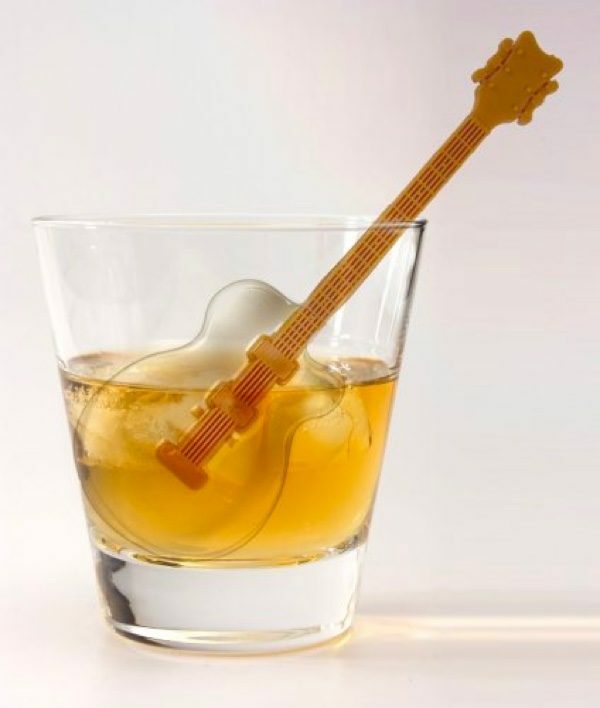 Guitar Ice Tray & Stirrer: Create a stir during drinks with a guitar in your whiskey. A silicone arm with ice forming the body makes alcohol musical. 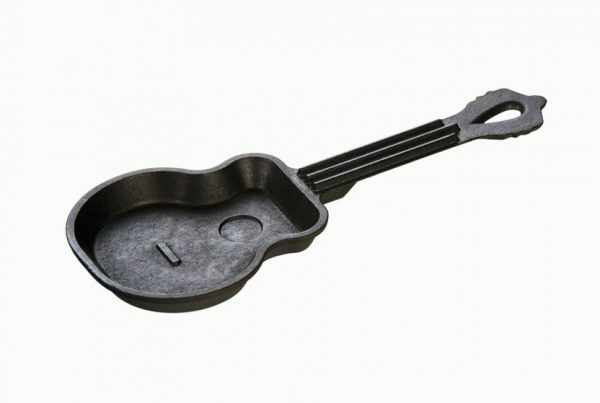 Guitar-Shaped Frying Pan: Fry up some eggs in an unconventional shape. 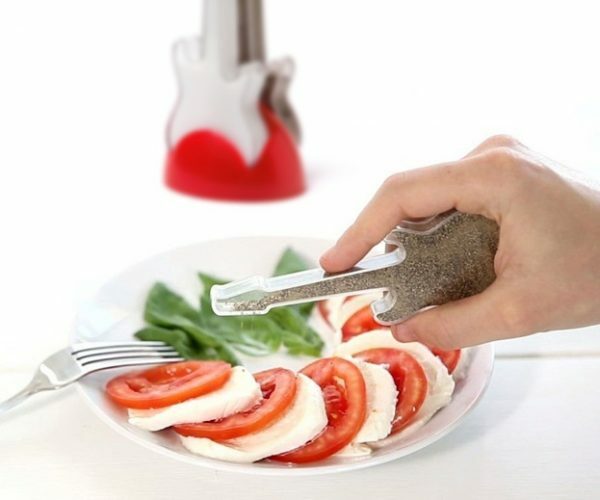 This guitar-shaped frying pan lets you flip over treats on the strings of a guitar. 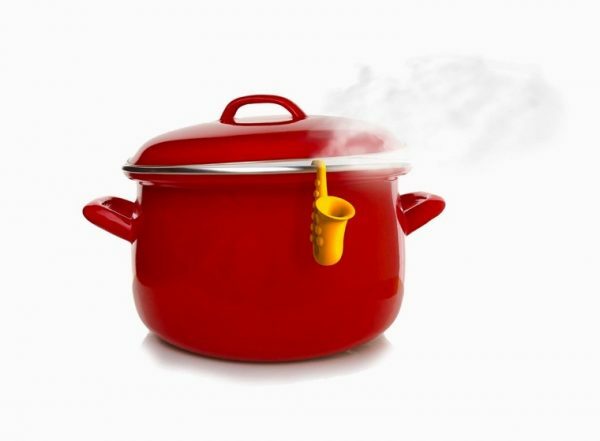 Saxophone-Shaped Pot Lid Lifter: For the chef who has everything, this saxophone-shaped pot lifter is an easy safeguard for near-burnt hands. 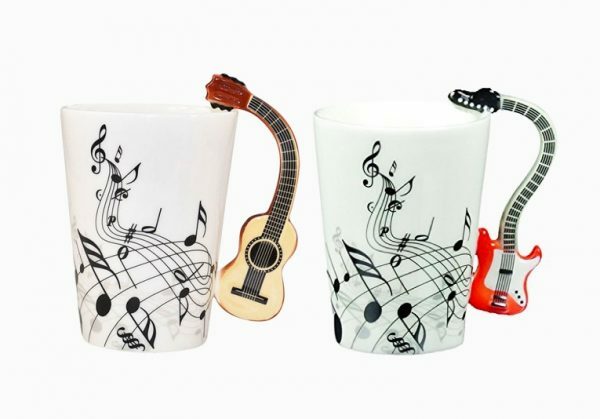 Musical-Themed Coffee Mugs: Rock out with these coffee mugs, a perfect way to add a jam to your morning coffee. 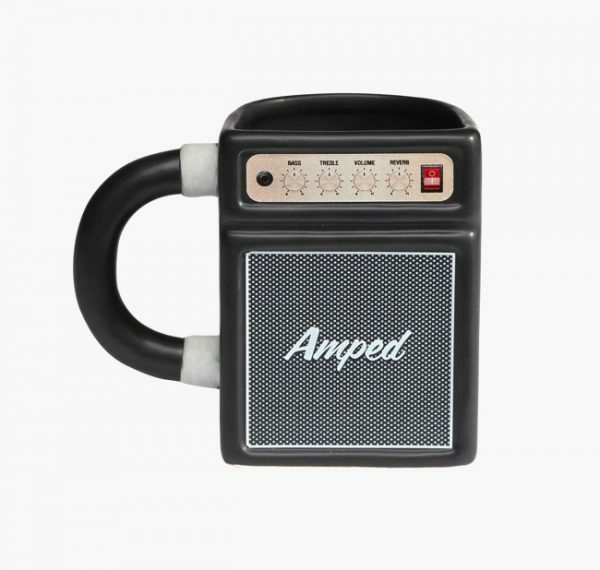 Amped Guitar Amp Coffee Mug: Go the extra distance with an amp for a cup. This distinctly unique coffee mug predicts your caffeinated future. 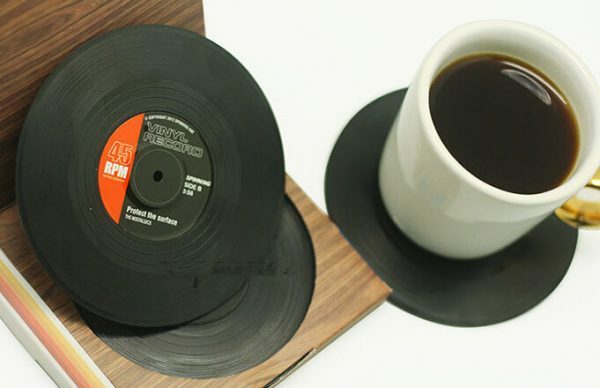 Vintage Vinyl Record Drink Coasters: Normal coasters just won’t do for the diehard record lover. Slide these unique drink coasters under your hot beverage for a noteworthy kitchen addition.